The Cunard fleet is one of the youngest at sea, benefitting from the best facilities and the widest range of entertainment and leisure options available on the ocean today. Take a Cunard voyage and you'll enjoy the renowned elegance, spacious luxury and excellent service that have attracted discerning travellers to their famous ships for many decades. If you enjoy traditional cruising, with an air of sophistication, where every night is an occasion worth dressing up for, then Cunard is definitely for you. If you're new to Cunard, don't worry, you'll soon become accustomed to certain aspects of the cruise that are uniquely Cunard. Their fleet comprises three exceptional ships – Queen Elizabeth, Queen Victoria and flagship Queen Mary 2. Grand in scale, yet stylish down to the tiniest detail. And whether you want a sumptuous suite, or a room with a view, they've got every type of accommodation to make your voyage as comfortable as possible. Explore the world in style with Cunard. From November 2020 to May 2021, the Cunard fleet will travel 138,833 nautical miles visiting incredible places across the globe. The most famous cruise ships in the world call at 94 destinations in 38 different countries, including 4 maiden calls for the current fleet. Each voyage, whether it’s a 2 night short break or a full 108 night world voyage aims to deliver refined journeys for guests. Cunard World Club members should book your Winter 2020/21 Cunard voyage by 30th June 2019 to save 5% off the fares shown on the website! 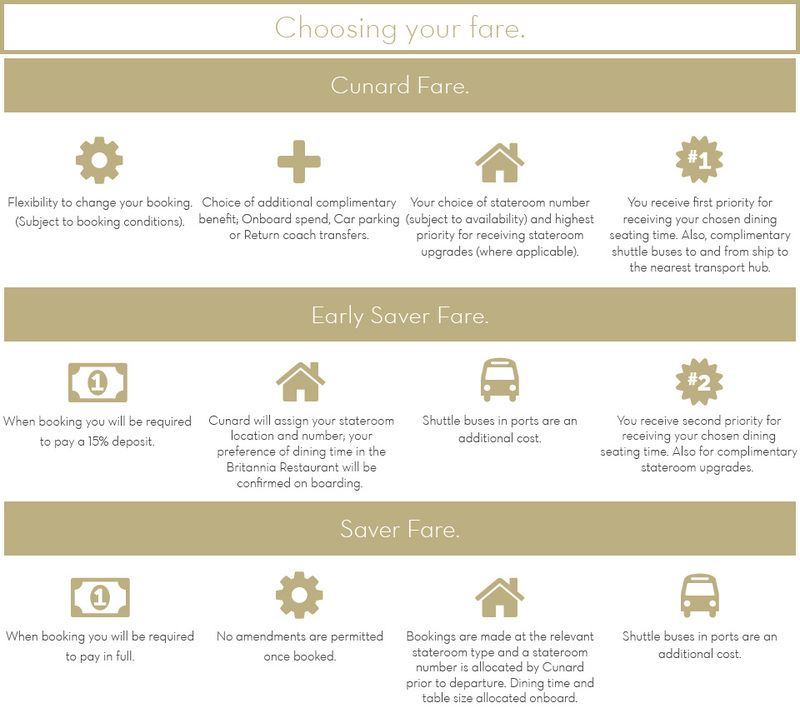 Which fare is right for you? View the benefits of each fare type here. Take a look at a selection of Cunard's sailings from Southampton below. If you would like to view the itinerary and latest fares click the blue 'View Details' button. If you would like more information and the latest availability click on the red 'Enquire Now' button. In 2019 the Cunard fleet will travel over 167,000 nautical miles visiting incredible places across Europe and around the World. The most famous Ocean Liners in the world call at 78 destinations in 25 different countries, including 16 overnight stays, 11 late evening departures and 2 new maiden calls for the current fleet. Each voyage, whether it’s a 2 night short break or a 36 Grand Voyage aims to ensure guests feel inspired, feel special and feel free. T&Cs: Cunard Fares shown are per person in £ sterling based on two adults sharing the lowest grade of stateroom available (or single occupancy in a single stateroom), within the applicable stateroom type and are subject to availability. Fares for sole occupancy and supplementary fares are available on request. On board spending money varies by cruise duration and meta category and applies to the first two guests sharing a stateroom. This can be spent on a variety of on board experiences, from speciality dining, to spa treatments, shore excursions and drinks packages. On board spending money is non-refundable and non-transferable. If the guest is a Cunard World Club member, on board discount applies after all on board credit has been used.